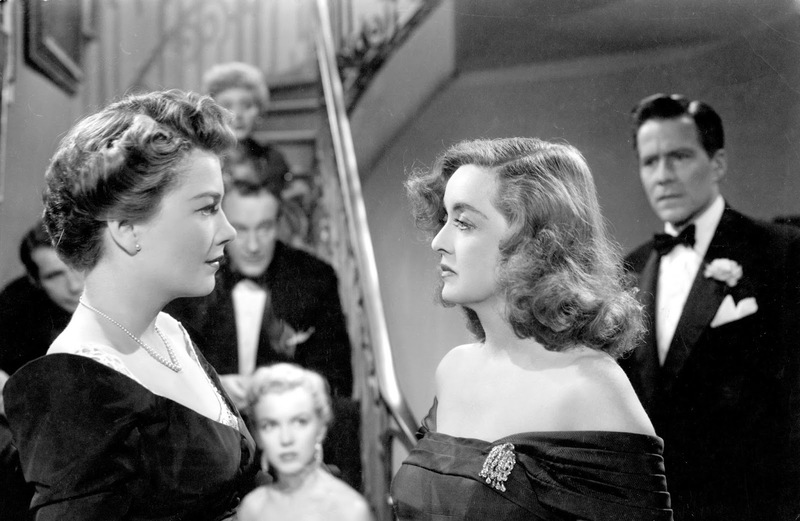 CinemaVIEW• RWU Spring 2019: ALL ABOUT EVE - Fasten your seatbelts, it's going to be a bumpy night! ALL ABOUT EVE - Fasten your seatbelts, it's going to be a bumpy night! Growing older was a smart career move for Bette Davis, whose personality was adult, hard-edged and knowing. Never entirely comfortable as an ingenue, she was glorious as a professional woman, a survivor, or a bitchy predator. Her veteran actress Margo Channing in "All About Eve" (1950) was her greatest role; it seems to show her defeated by the wiles of a younger actress, but in fact marks a victory: the triumph of personality and will over the superficial power of beauty. She never played a more autobiographical role. Davis' performance as a star growing older is always paired with another famous 1950 performance -- Gloria Swanson's aging silent star in "Sunset Boulevard." Both were nominated for best actress, but neither won; the Oscar went to Judy Holiday for "Born Yesterday," although Davis' fans claimed she would have won if her vote hadn't been split, ironically, by Anne Baxter, who plays her rival and was also nominated for best actress. When you compare the performances by Davis and Swanson, you see different approaches to similar material. Both play great stars, now aging. Davis plays Margo Channing realistically, while Swanson plays Norma Desmond as a gothic waxwork. "Sunset Boulevard" seems like the better film today, maybe because it fits our age of irony, maybe because Billy Wilder was a better director than Joseph Mankiewicz. But Davis' performance is stronger than Swanson's, because it's less mad and more touching. Daviswasa character, an icon with a grand style, so even her excesses are realistic. The movie, written by Mankiewicz, begins like "Sunset Boulevard" with a narration by a writer - -the theater critic Addison DeWitt (George Sanders), bemused, cynical, manipulative. He surveys the room at a theatrical awards dinner, notes the trophy reserved for Eve Harrington (Baxter), and describes the survivors of Eve's savage climb to the top: her director Bill Sampson (Gary Merrill), her writer Lloyd Richards (Hugh Marlowe), Lloyd's wife Karen (Celeste Holm), who was her greatest supporter. And the idol she cannibalized, Margo. As the fatuous old emcee praises Eve's greatness, the faces of these people reflect a different story. The movie creates Margo Channing as a particular person, and Eve Harrington as a type. Eve is a breathless fan, eyes brimming with phony sincerity. She worms her way into Margo's inner circle, becoming her secretary, then her understudy, then her rival. Faking humility and pathos is her greatest role, and at first only one person sees through it: crusty old Birdie (Thelma Ritter), Margo's wardrobe woman. "What a story!" she snaps. "Everything but the bloodhounds snappin' at her rear end." Margo believes Eve's story of hard luck and adoration; no actor has much trouble believing others would want to devote their lives to them. Good, sweet Karen also sympathizes with the girl, and arranges to strand Margo in the country one weekend so that Eve can go on as her understudy. Karen is repaid when Eve tries to steal her playwright husband, after an earlier, unsuccessful attempt to steal Margo's fiancé, Bill. He is played by Merrill (Davis' real-life husband), who turns her away with a merciless put-down: "What I go after, I want to go after. I don't want it to come after me." Eve is a universal type. Margo plays at having an ego but is in love with her work -- a professional, not an exhibitionist. She's the real thing. But the sardonic tone of the film is set by Sanders, as DeWitt. He's the principal narrator, and with his cigarette holder, his slicked-down hair and his flawless evening dress, he sees everything with deep cynicism. He has his own agenda; while Eve naively tries to steal the men who belong to the women who helped her, Addison calmly schemes to keep Eve as his own possession. Sanders, who won the Oscar for best supporting actor, lashes her in one of the movie's most savage speeches: "Is it possible, even conceivable, that you've confused me with that gang of backward children you play tricks on? That you have the same contempt for me as you have for them?" And: "I am nobody's fool. Least of all, yours." Glittering in the center of "All About Eve" is a brief supporting appearance by Marilyn Monroe. This film, and John Huston's "The Asphalt Jungle" earlier the same year, put her on the map; she was already "Marilyn Monroe," in every detail. She appears at Margo's party as DeWitt's date, and he steers her toward the ugly but powerful producer Max Fabian (Gregory Ratoff), advising her, "Now go and do yourself some good." Monroe sighs, "Why do they always look like unhappy rabbits?" It has been observed that no matter how a scene was lighted, Monroe had the quality of drawing all the light to herself. In her brief scenes here, surrounded by actors much more experienced, she is all we can look at. Do we see her through the prism of her legend? Perhaps not; those who saw the movie in 1950, when she was unknown, also singled her out. Mankiewicz helped create her screen persona when he wrote this exchange after the Monroe character sees Margo's fur coat. "Now there's something a girl could make sacrifices for," Monroe says. "And probably has," says the director. "Sable?" asks the producer. "Did she say sable or Gable?" If Monroe steals her own scenes, the party sequence contains Davis' best work in the movie, beginning with her famous line, "Fasten your seat belts. It's going to be a bumpy night." Drinking too much, disillusioned by Eve's betrayal, depressed by her 40th birthday, she says admitting her age makes her "feel as if I've taken all my clothes off." She looks at Bill and bitterly says: "Bill's 32. He looks 32. He looked it five years ago. He'll look it 20 years from now. I hate men." It was believed at the time that Davis' performance as Margo was inspired by Tallulah Bankhead. "Tallulah, understandably enough, did little to dispel the assumption," Mankiewicz tells Gary Carey in the bookMore About All About Eve. "On the contrary, she exploited it to the hilt with great skill and gusto." Press agents manufactured a feud between Davis and Bankhead, but Mankiewicz says neither he nor Davis was thinking of Bankhead when the movie was made. Davis could have found all the necessary inspiration from her own life. Davis smokes all through the movie. In an age when stars used cigarettes as props, she doesn't smoke as behavior, or to express her moods, but because she wants to. The smoking is invaluable in setting her apart from others, separate from their support and needs; she is often seen within a cloud of smoke, which seems like her charisma made visible. Mankiewicz (1909-1993) came from a family of writers; his brother Herman wrote "Citizen Kane." He won back-to-back Oscars for writing and directing "A Letter to Three Wives" in 1949 and "All About Eve" in 1950, and is also remembered for "The Ghost and Mrs. Muir" (1947), "The Barefoot Contessa" (1954) and "Guys and Dolls" (1955). He remained sharp-tongued all of his days. 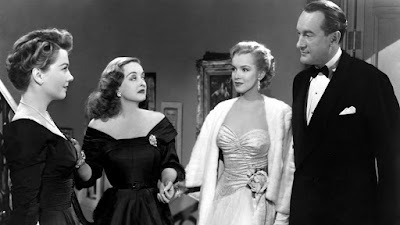 When "All About Eve" was recycled into the Broadway musical "Applause," Mankiewicz observed that the studio had received "infinitely more" in royalties than it paid him for writing and directing the film. He said he had no complaints. The reason they have the "no refunds" sign in the theater ticket window, he said, is to keep the rubes from calling the cops.